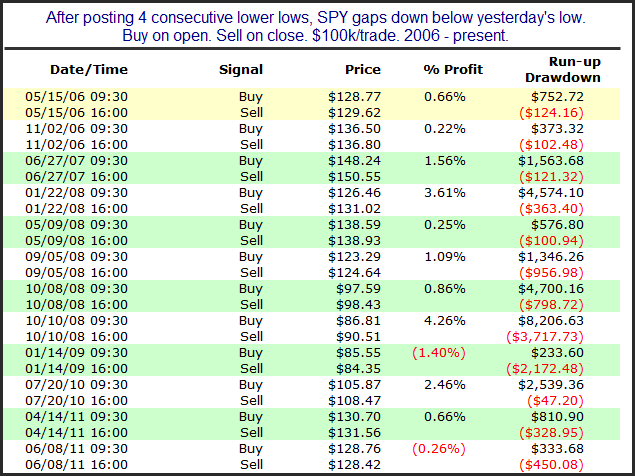 The market is already short-term oversold and now SPY is gapping down large this morning. I looked at other times there were 4 lower lows followed by a gap down below the previous day’s low. Below are results looking back to 2006. Not a ton of instances but the stats lean quite heavily to the long side. Between 2003 and 2006 the upside tendency was not apparent. I was unable to look back past 2003 this morning. Below are all instances from 2006 – present. If you find morning gap analysis like this useful, you may want to check the work of my friend, Scott Andrews over at MasterTheGap.com. I look at studies like this occassionally, but it is his primary focus. The gap down on Friday occurred in reaction to the release of the employment report. The employment report is typically released on the first Friday of the month, though in some cases such as this month it occurs on a different day. This weekend I spent a good amount of time going through the BLS website and programming in all the employment days from 1993-present. I looked at Friday's action a few different ways with regards to employment days. I found it was only the 10th time that the SPY has gapped down over 1% and failed to fill that opening gap. 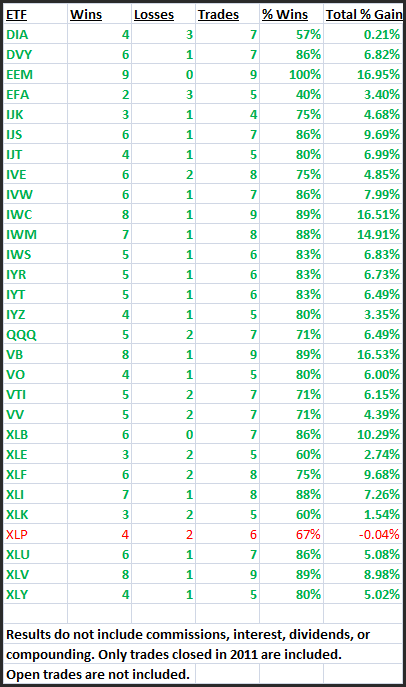 While I didn’t find the results significant, below I have listed the other 9 instances along with their 1-day returns. These results seem to imply a mild inclination towards further selling the next day. 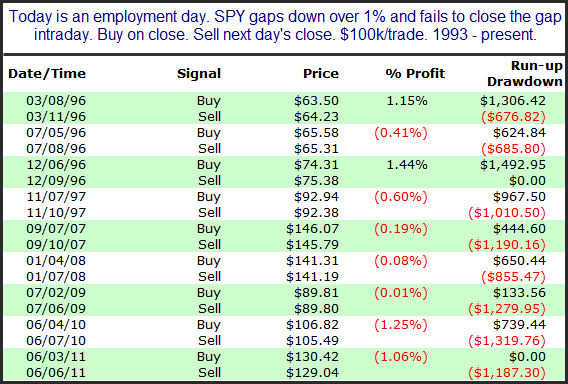 Another way that I looked at employment day gaps was by using a 200ma filter and eliminating the 1% size requirement. Overall the results of doing this didn’t suggest much. I did find it interesting though that there have been three instances since the March 2009 bottom and all three instances were followed by further declines ranging from 2.4% to 4.3% during the course of the following week. Those three instances occurred on 7/2/09, 8/6/10, and 6/3/11. I don't believe either of these employment day studies is worth heavy consideration. My main take away is that the reaction to the employment report is not necessarily an overreaction. As the employment day results showed there does not appear to be an inclination for an immediate reversal. In fact, downside follow-through may be more likely. I continue to see a good mix of studies. The one below is bearish but I could also point to some bullish evidence that is perhaps just as compelling. Anyway, when the VXO has remained extremelely stretched for multiple days, it typically signals the SPX is about to pull back. You can see this in the study below, which triggered on Friday at the close, and could be found in the intraday Quantifinder prior to that. I find the note at the bottom of the table to be especially interesting. It implies that the current setup provides a high probability of a quick pullback, but if that pullback doesn't appear quickly that there is a good chance that the market will continue to power higher. I’ve updated the Quantifiable Edges Big Time Swing System overview page with results through June 30th. There is not a trade currently open. I don’t update results that often since the system only trades about once per month on average. The 1st half of 2011 produced a tame but still positive return of 3.00% for SPY (including dividends, commissions of $0.01/share, and an assumed interest rate on cash of 0.18%). This was achieved with 1 short trade and 5 long trades. For those looking for a system that they can use as a base to build their own system from, the Big Time Swing is an attractive option. It is all open-coded and comes complete with a substantial amount of background historical research. And since it is only in the market about ¼ of the time, it can easily be combined with other systems to provide greater efficiency of capital. Once you’re ready to try and improve the system yourself you can also refer to the system manual or the August 2010 purchaser-only webinar – both of which discuss numerous ideas for customization. Short-term direction is unclear at the moment. There is a mix of studies suggesting both bullish and bearish inclinations. Here is an interesting one from last night’s letter with bearish inclinations. The fact that the gaps up each day went unfilled could suggest that a good portion of the buying may have been done by shorts who were forced to cover as prices began to get away from them. The number of instances has been quite low. On average we’ve only seen this setup occur about once every 2 years. In every case there has been a move lower in the next day or two. Statistics strongly favor the downside. 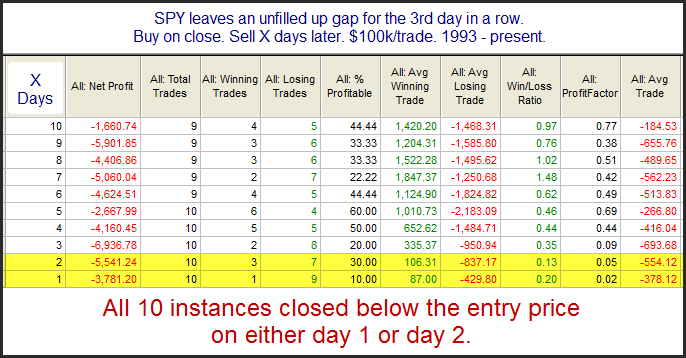 Note: for this study (and most others related to SPY gaps) I consider the gap to be from the previous day's close - not the previous day's high.